Mocca is one of many excellent products from Fiedler and Lundgren. With their policy of maintaining excellent quality and only using top-level tobacco leaves, Mocca is a snus not to miss. One of the few snus products available that comes in a metal can; it holds the flavour and the aroma better than most. Upon opening a can, a powerful aroma bursts forth. Flavours of fruit and spices are featured in the Mocca brand; with smaller, more discreet portion sizes that sit comfortably under the lip. Mocca products come in a wide variety of flavours while still enjoying the subtle taste of tobacco, and without losing the sought after nicotine hit. Some Mocca variations have a light tobacco flavoured base with notes of aniseed, liquorice and citrus. This more unusual combination will appeal to those seeking a change from the more floral based flavours of snus. The white snus is a snus for those who prefer their snus to be slightly drier than the usual moist version. The white snus is also a non-drip snus that holds the flavour for a solid length of time. 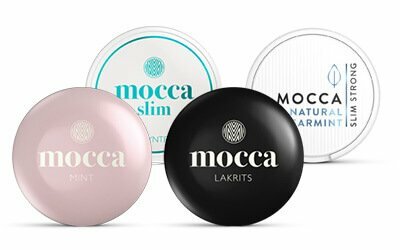 Mocca comes as a refreshing change among the various brands of snus, as it has a particular look that will appeal to those users looking for a more dainty style of snus. The design of the packaging has an elegant, more feminine look. Pastel colours or an evening black, with a minimalistic logo gives it a stylish edge, and the small round can is smooth to the touch and easy to slip into small bag. That’s not to say that men cannot use it because of course they can and do. Following the female trend though, the flavours are natural yet muted; nothing too strong, just a refreshing and mellow taste. This is a much gentler snus than most and contains much more aromatic scents than usual. There is also slightly lower nicotine content per portion sitting at only 5mg rather than some of the higher amounts offered in other brands. Like all Fiedler and Lundgren brands, Mocca is made out of only the best ingredients. Generally snus is a mixture of tobacco, salt and water with the flavours added. Whilst tobacco quality will change depending on soil, type and weather, it is consistently the upper leaves that yield the most potency and contain the best wax and essential oils. Part of the secret of Fielder and Lundgren’s high quality snus brands, lies in their use of only these higher leaves, and therefore providing the customer with nothing but the best. Mocca is one of many brands created and manufactured by the company Fiedler and Lundgren. This is one of Sweden’s earlier companies; originally established in 1783. Fiedler and Lundgren created and maintained their own incredibly high standards for manufacturing and product quality, which has ensured that over the years their products have remained almost unbeatable for their level of quality. In 1915 the board members of Fiedler and Lundgren relocated the company to Denmark. During this time they continued manufacturing and it wasn’t until 2002 that the company returned to Sweden. As leaders in the snus and tobacco products market, Fiedler and Lundgren enjoy a huge amount of popularity on a global scale. The company has strong ideals about its products and the main goal is to offer a strong but pure taste to their customers. As the second largest snus manufacturer in Sweden, Fiedler and Lundgren offers the world multiple different brands and styles of snus. Their continued success is mainly based on the fact that they only use the highest quality tobacco leaves and take great pride in their measurements of oil and leaf within each snus portion ensuring that the quality is consistent throughout all their products.